Thank you for submitting a photo for the Katie Miller Young Adult Cancer Conference on May 1, 2019. 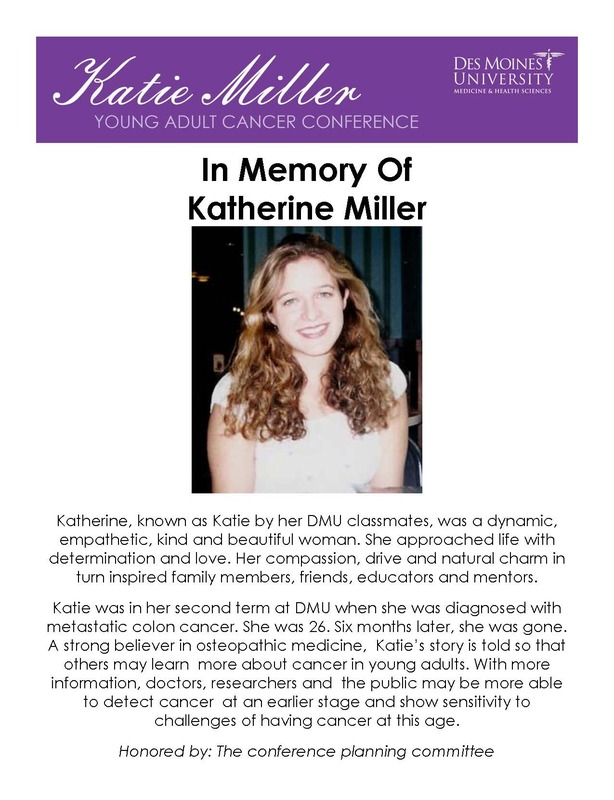 The Katie Miller Cancer Conference is a ceremony of remembrance and hope. It is a way to honor young adult (age 15 - 40) cancer survivors and those who have lost the battle. It is a time to reflect on our own or a loved one's cancer experience, to grieve for those we have lost, and to find hope that tomorrow holds the promise of a cancer-free world. The cost for each poster is $10 (covers cost to print the poster). Upon submission of this form, you will be directed to enter your payment information. Payment can also be made by calling the Des Moines University Continuing Medical Education (DMU CME) office at 515-271-1596 during normal business hours. Posters will not be printed until payment has been received. The DMU CME office will contact you if there are any questions. If you have not done so already, please RSVP for the conference so we can have an accurate count for dinner. All individuals in attendance are requested to RSVP. Please keep to approximately 350 characters (including spaces). Please provide a high resolution, print quality photo. 300 dpi or a 2MB file is preferred. Before clicking "submit", be sure the picture is uploaded.